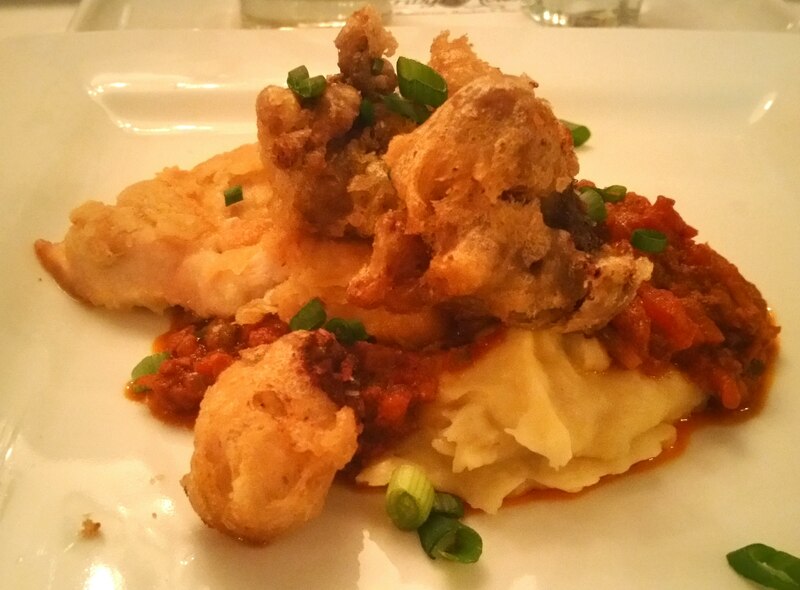 Chef Tim Grandinetti posted the new menu from Spring House Restaurant, Bar & Kitchen. What stands out to me is what appears to be the Spring House version of “Nashville Spicy Chicken.” There is, after all, M-80 sauce, I doubt that is like cool ranch. 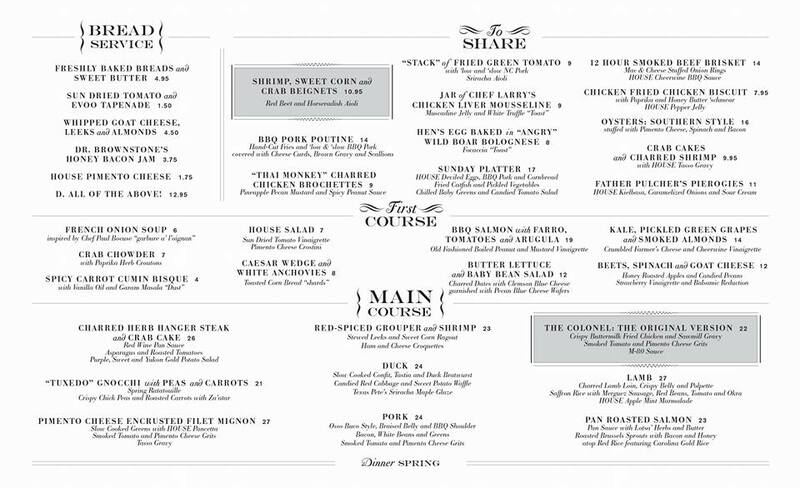 But, also, pimento cheese encrusted filet, hanger steak and crab, red-spiced grouper and shrimp? My mouth watered just reading over the menu. 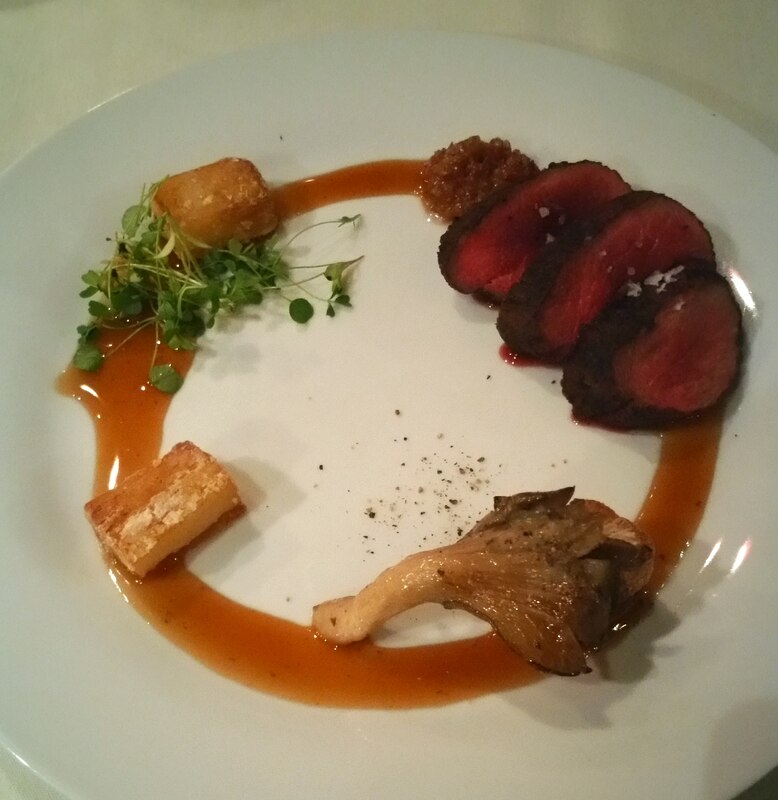 The first course selections are “springy,” as well. I can go on and on, but, I’ll just step back and let you look at the menu for yourself. You can find more about Spring House Restaurant, Bar & Kitchen here. We had the opportunity to sit among friends, in an intimate setting for the latest DiLisio’s Italian Restaurant Wine Dinner. Usually these dinners are for upwards of 60 people. For this dinner, there were only 18 people. I think this made the dinner more accessible from both the house’s perspective and the diners’. First, there’s the cosmetic upfitting that Tony and Maria did to the restaurant the week prior. The DiLisios changed the color scheme to a warmer earth-toned theme and moved away from the sometimes drab and dull white that has been the motif since the beginning. They replaced the floors and installed sound baffling on the ceilings and walls to help eliminate the abundance of noise the flat-surfaced walls admeasure at times. However, the true star of this remodel is the new bar area. They have simultaneously eliminated a less-than-attractive register area and the need to wade through waiting patrons to get to the “hostess” in order to obtain a place in line. In doing so, they created an aesthetically beautiful structure that allows for a few eating seats, a place to service the imbibing and allow for draft beer, a sure attraction. Add this to the fantastic fare that DiLisio’s is known for and you have a win-win. But, we’re here to talk about the pairing, so let’s. The dinner leaned a little heavy on the seafood and that’s a good thing. In fact, the first three full courses were seafood based. The wine pairings were on point and whether they stood on their own or not, their accompanying the foods they were with, molto bene! 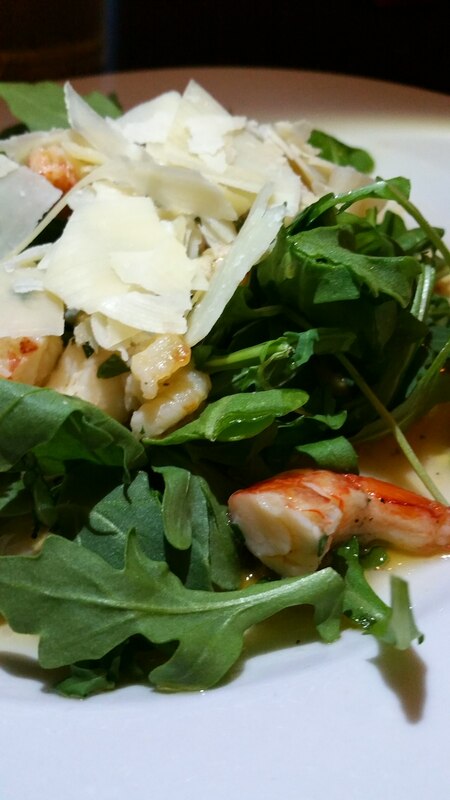 An arugula salad sounds basic enough, but add generous portions of shrimp and heap some shaved Parmesan cheese to the top and it jumps tall buildings in a single bound. Add the lemon extra virgin olive oil and it flies to the moon. It’s amazing how so simple a thing can be so extraordinary. The citrus on top of the shrimp reminded me of ceviche, even though I’m pretty sure that wasn’t the preparation process. And, the citrus wasn’t quaint, it was a full immersion of flavor that took the shrimp, cheese and arugula, all of which are quite flavor-potent in their own rights, for a joyride. This is paired with Domaine Laurent Miquel Albarino from France. The wine was fair on its own but the citrus and cheese in the salad were even more vivid when paired with this wine. For a first course, it was amazing how plentiful and powerful it was. Ostriche is Italian for oysters, not ostrich. 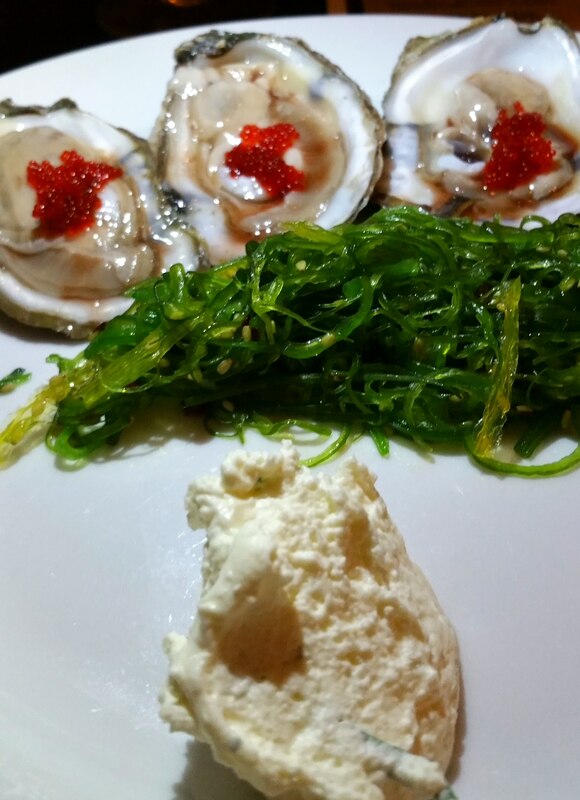 Three deliciously fleshy oysters, prepared raw with a dab of red roe caviar on each. A tangy creme fraiche dolloped on the plate made a great team when added to the roe-topped oysters. But, really, what made it near perfect was the addition of the seaweed salad that separated them by position but brought them to a perfect harmonious union. I have become quite fond of this particular style of seaweed and its pickled tang with chewy texture sat on the oyster with the caviar and creme fraiche like royalty upon thrones. The flavor was just as majestic. Some of the guests were a little hesitant because the oysters were raw, which, was good news for me because my near neighbors allowed me to finish off what they weren’t keen to. I believe I had around nine total. 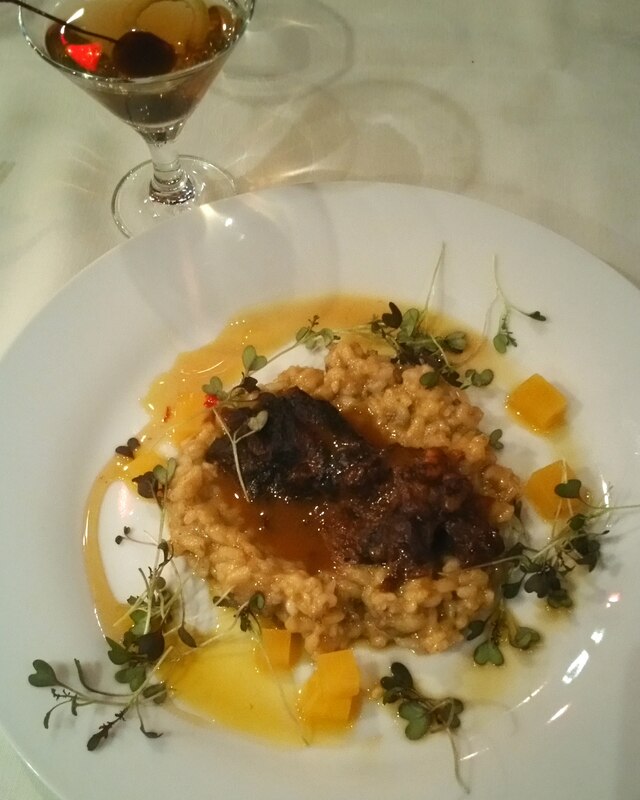 The ostriche was paired with Echo Bay Sauvignon Blanc, Marlborough, New Zealand. This light and airy white wine made it easy for the seaweed and creme fraiche to envelop the oysters and caviar creating a party on the half shell. Sounds simple enough, right? Wrong! 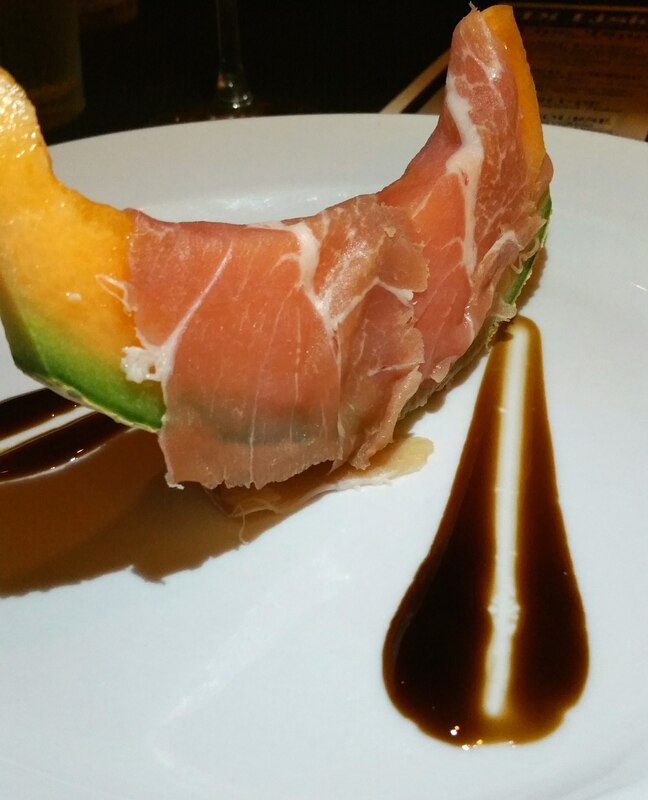 Sure, it is a cantaloupe that has thinly sliced Italian ham draped over it like it was putting it to bed. But, you add the dark and rich balsamic gastrique to the ensemble and you get a salty-sweet explosion that I really don’t believe your taste buds are ready for. There was more than one person “oohing and ahhing” over this course. It is meant as a palate cleanser and the melon does its job, all while showing you its new friends’ tricks along the way. Okay, simple yes. Plain? No way. Ah, the steak-like swordfish. Cooked nicely; not too done and not under done. This sitting on some of the creamiest, yet firm risotto that I can remember having tangy from the marscarpone and orange. A blood orange sits to the side with the crusty bread. As I have said before, the perfect secret ingredient is the microgreens. Earthy and bright, these tiny leaves pack quite a wallop. I think the microgreens are a wonderful compliment to almost any savory dish, here’s no exception. 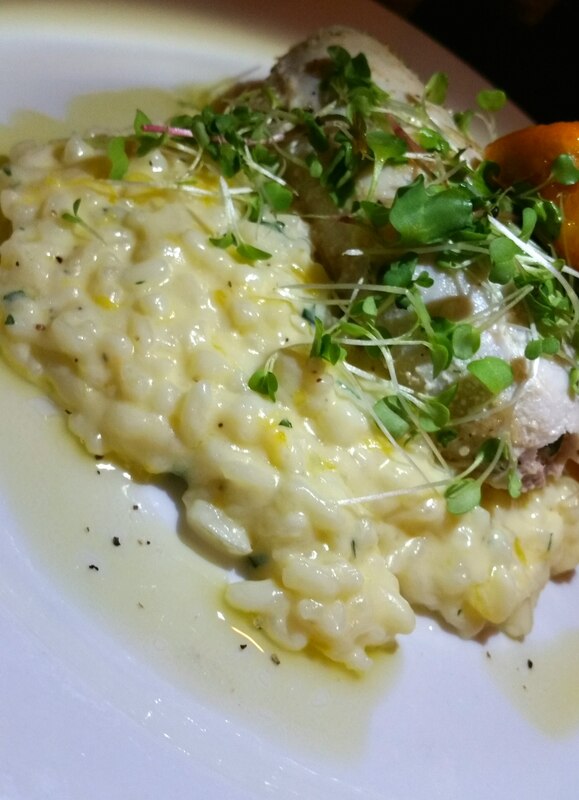 Meld the earthy and bright with the swordfish and lemon-tinged roulade; almost plate licking good. This was paired with Treanna White Blend, Central Coast. 50% Marsanne, 50% Viognier grapes. I will be honest that I really did not like this wine. At least, not on its own. However, when I took a bite of the risotto, swordfish roulade and microgreens and then sipped this wine, it opened my mind and taste buds to its true potential. It is not a wine that I would go out of my way to drink but if I’m having swordfish with creamy risotto, then I may give it another try. Tony DiLisio described this as Italian Filet while spezzatino di carne actually means “stew meat.” I will say it was quite tender. It was cooked closer to medium/medium-well and I would have rather it be medium-rare, but other than that, its seasoning and texture was spot on. The only thing that kept it from perfect was the temperature and in the long run, that was not an issue. 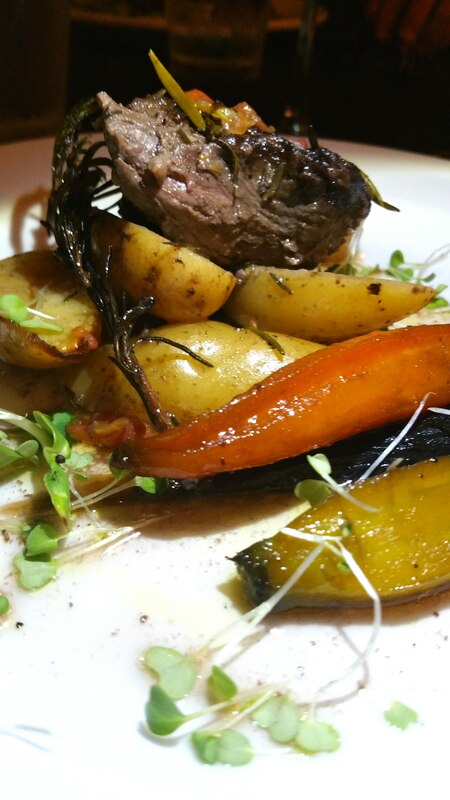 The beef was placed on top of nicely seasoned potatoes along with pickled carrots and, you guessed it, more microgreens. The pairing for this was Ferrari-Carano “Siena,” Sonoma, a delicious jammy red with a good bit of blackberry, raspberry, vanilla and a bit of darker flavors, those of cocoa and licorice. I have always been a white wine drinker but I have found that there are many reds that I have started to grow quite fond of; especially when having it with red meat. The fruit-forward jamminess compliments the savory beef and vegetables. This is a marriage made in paradise. I will not say that the wine was the highlight of the meal but it was certainly a major contributor. 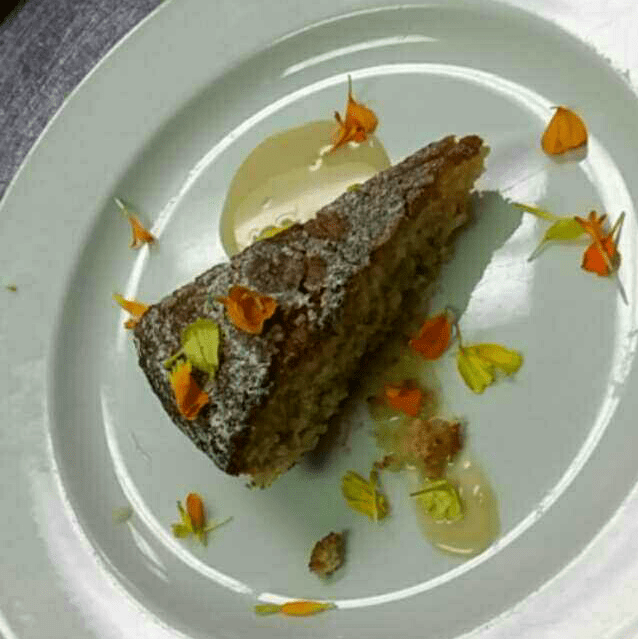 A moist cake with lemon with a thin, syrupy, almond sauce and edible flowers. It was sweet but not too. The almond coulis mixed with the edible flowers was a nice touch with the cake. 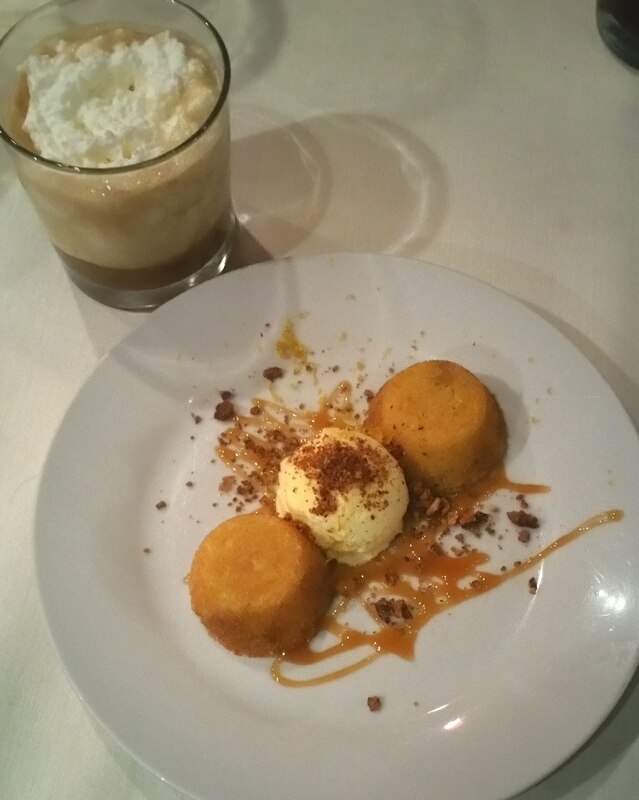 This was not my favorite dish of the evening but desserts rarely are. That, however is not to say that I did not enjoy it or that there was anything bad about it. It is fitting that it had an almond coulis as the pairing was almond as well. 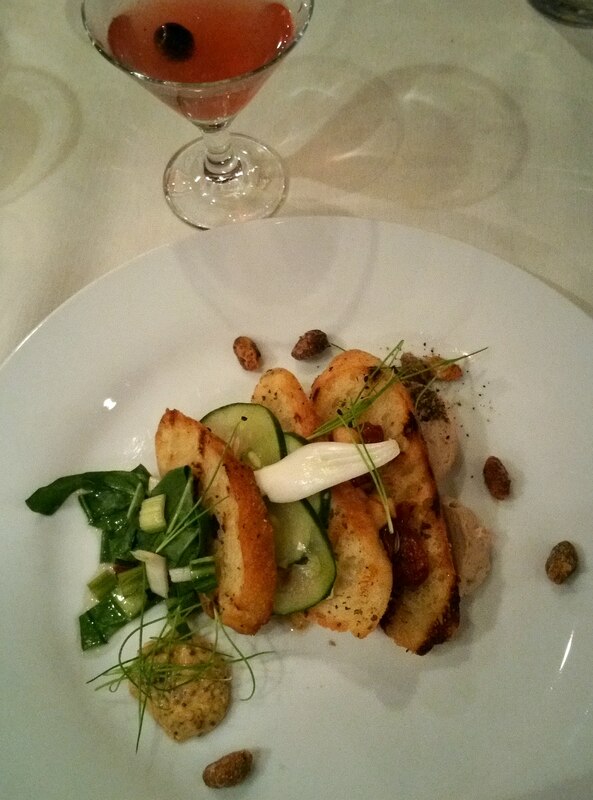 The pairing was with the JFJ Almond Brut, California. This is some sparkling white that is fully infused with almond flavor. I had this wine once before and liked it so much I purchased two bottles of it. The almond flavor was flowing abundantly between the coulis and the wine. The cake almost got lost in the mix, but that is not a bad thing, either. The nutty profiles were the stars of this course and with good measure. If you have the chance to have the JFJ, especially when you have other almondy things in the mix, you should certainly jump at that chance. Tony DiLisio is a fantastic chef. He has a cadre of professionals in the kitchen with him. Maria DiLisio’s servers are loyal and attentive and top-notch. Together this team knows how to bring you finest in food pairings; the best Italian food and wine pairings. Each of their pairing dinners are something new, different and honest. These dinners are where Tony shows off. DiLisio’s everyday fare is exactly what it should be. An Italian meal that is honest, delicious and authentic. Sometimes, Italian (as well as other specialized cuisines) restaurateurs have the tendency to try to “jazz” up the wheel when the wheel is perfect the way it is. When I go for Italian, I want the spaghetti, lasagna, picatta, caccitore, amici and other like meals to be “authentic” and true; not jazzy. I would never call DiLisio’s plain, just “delightfully right.” But, as I said, these meals are Tony’s time to shine. He creates works of art that we are able to, and happy to put into our mouths. The portions are not huge and they are not meant to be. The one thing I will say about these wine dinners is when they pour the wine, until that course is over, they will continue to fill your glass when you finish it until you tell them to stop. Most places give you a tasting and then you are done with it. Not here, and thankfully so. As I said before, all of these wines were spot-on, whether on their own or paired. Bravo, Tony, il amico mio! Fantastico! I write this Food Pairing Series with the idea of highlighting the chefs, restaurateurs and other merchants that make this area wonderful for food. You should know where to find the best food and drink when it is out there waiting to be tasted. You can find more about DiLisio’s by visiting their website here. They are on Twitter (@medilisios) and Instagram (@dilisios). DiLisio’s does not accept reservations but if you need to call in an order or ask questions, you can reach them at 336-546-7202. Bon appetit! or should I say: Buon appetito!! This is part of the “Food Pairing Series” that will convey the culinary genius that is Winston-Salem’s (and surrounding areas’) wonderful restaurateurs, chefs and food visionaries. This series isn’t designed to display any certain holidays, seasons or time frames. It is simply a demonstration of what the area has to offer and why you should follow the restaurants and chefs to be informed about the events that they will be holding in the future. You won’t be disappointed… guaranteed. Enjoy! This event brought a pre-Valentine’s treat for Stephanie and me. 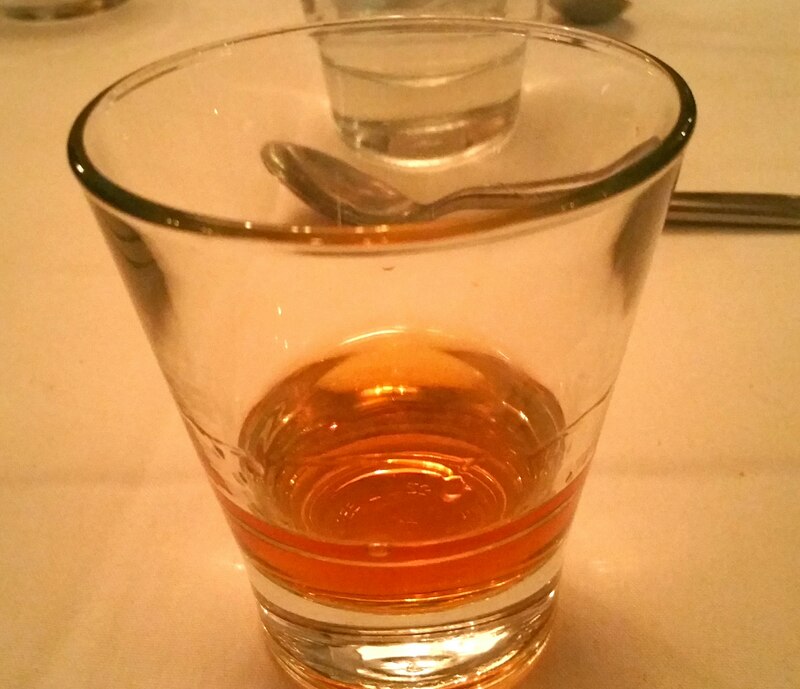 We were guests at the chef’s table for Tim Grandinetti’s American Whiskey Celebration, AKA the “‘Illest Bourbon Dinner.” A limited-seating event (there were only 16 people, max), we were treated to some fantastic bourbon and delicious food at Spring House Restaurant, Kitchen and Bar. 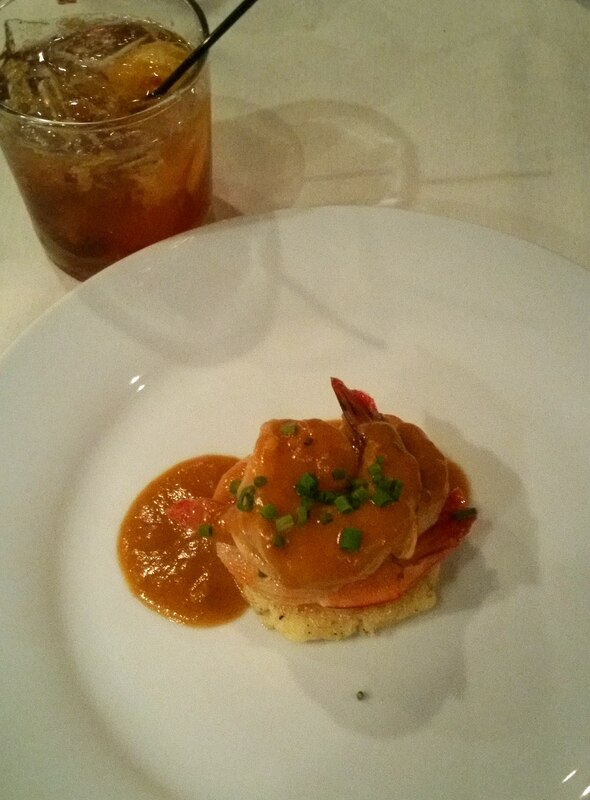 First off, who doesn’t like seafood saddled beside (or on top or under) a bourbon gravy laced with bacon? Especially when that bacon is the delicious Italian pancetta? 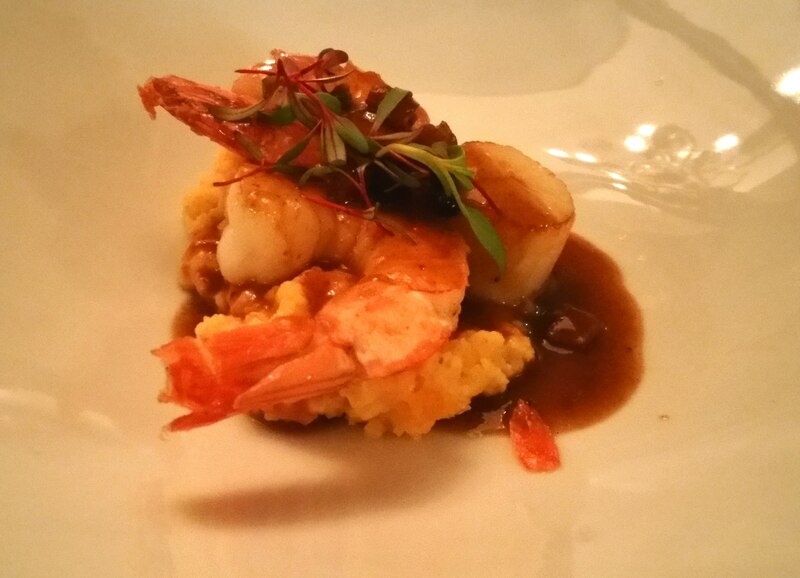 Well, here you have large, meaty shrimp and tender diver scallops that are perfectly enveloped in this pancetta bourbon glaze and all of this on top of creamy grits. And, please, don’t forget the microgreens. I have gotten on a microgreens kick lately and these, while quaint, set it all off. 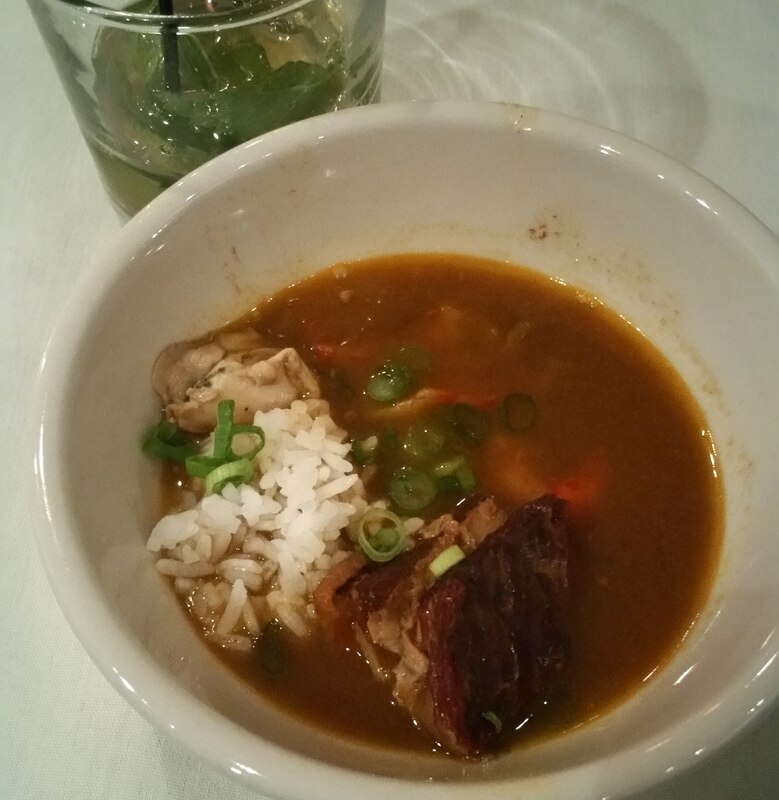 It was a small dish but bursting with large flavor; lots of smokiness, wonderful savory and seafood tastes. 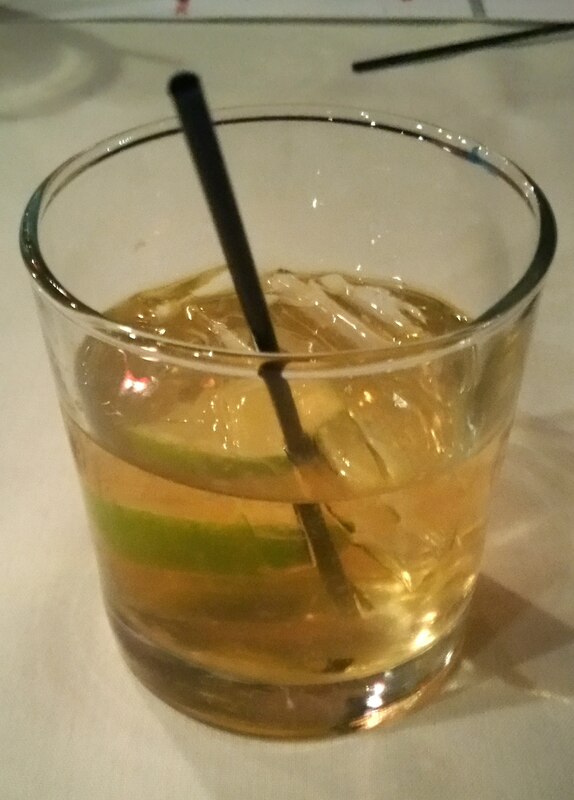 Pair this with a craft cocktail called “Maple Ginger Smash” and that was made with Buffalo Trace Whiskey. It’s spiciness matched with that of the ginger and against the sweet of the maple creates a flavor party for your mouth. This along with the salty pancetta, the earthy microgreens and our delicious friends from the sea? A wonderful first course. I’ve just discovered the joys of duck in the last few years and duck confit (cooked in its own fat) is even better. I’ve really never been a fan of dark fowl meat: duck, turkey, chicken, etc., but lately these things have started to really appeal to me. First, though, there’s a smeared smattering of the Grand Marnier aioli. Grand Marnier is absolutely my favorite liquor or liqueur, ever. So, an aioli – not unlike (but not exactly) mayonnaise but with garlic – made with this lovely orange treat is just perfect. 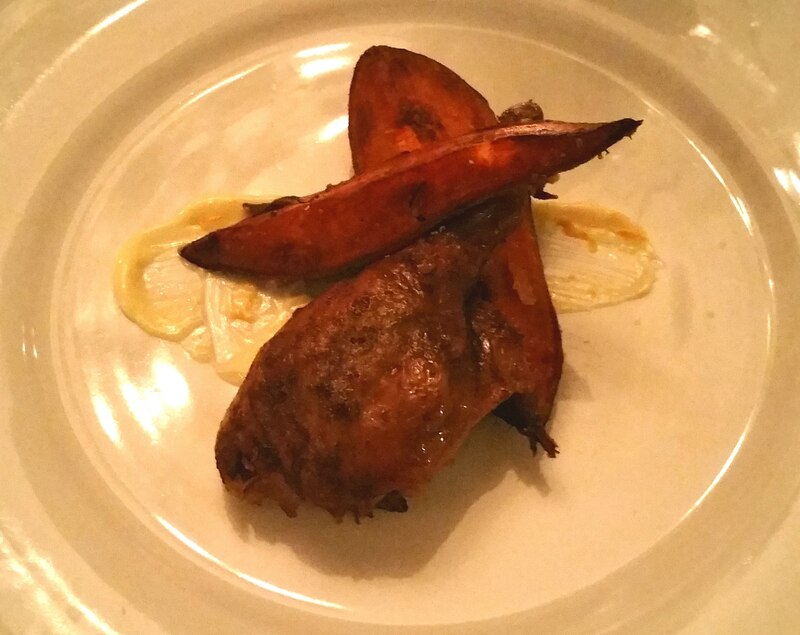 Take the fat-cooked duck leg and place it on top of said aioli and it’s a match made at least near heaven. Garnished with large-cut sweet potato steak fries, both they and the duck are great candidates for “dipping” in the aioli. I believe this was my favorite dish of the night. The duck was paired with the craft cocktail called “Toasted Apples” made with Basil Hayden, a lighter bourbon in the Jim Beam family. The lighter bourbon with the fresh apple essence went well with the dark fowl and created a delightful contrast and flavor balance. The palate cleanser was a delicious sorbet that was infused with Maker’s Mark, a very flavor-rich bourbon. The wood notes of the bourbon and the sweetness of the honey makes a great match for the apple flavors. I could have eaten about 12 more of those. Take some potatoes, whip them up with creamy brie and scallions and you have a delicious bed on which to lay your breaded bourbon chicken. Then take chicken livers and hearts and bread them up and place them on the potato bed right next to the wonderful chicken. They are from the same bird so, naturally they make great bedfellows. I’ll be honest, chicken innards aren’t usually my thing, but Tim Grandinetti has a way of making me eat things I normally wouldn’t. The hearts were a little more chewy than I’d want, but they were definitely edible. The livers were quite earthy but when you mixed all that with the roasted tomato chutney, the tomatoes gave just the right amount of acidity to the hearty bird and potatoes. This bread pudding was sticky (which I think is the point) and moist. It was made with a Krispy Kreme streusel and that WSNC staple brought new life to the pudding. Add a side of egg foam and you get a creamy sauce to pour over the pudding/streusel to lighten it up a bit. It was good, but the anticipation of the bourbon distracted me from getting a full flavor experience. The bourbon in question was the Pappy Van Winkle 15 year-old. Pappy is made in very small batches: perhaps 7000 bottles a year (compared to 7 million cases of Jim Beam a year). Its flavor was the absolute smoothest I’ve ever tasted in a bourbon. You get the full bourbon hit but, it’s very low on the bite, which is what some people complain about with bourbon. I am honored to have tried this, especially with the company I was with when doing so.